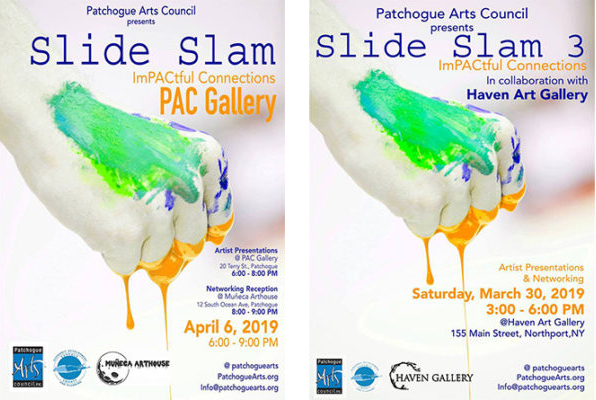 Event: "Slide Slam" ImPACtful Connections - Artist Talks & Networking | Patchogue Arts Council, Inc. The Patchogue Arts Council is excited to announce 2018-2019 Slide Slam! Join us at Haven Art Gallery and at the PAC Gallery to hear 5-minute artist presentations from 15-20 selected artists for an audience! Immediately following presentations at PAC from 6:00 – 8:00 PM we will host a networking reception at Patchogue’s newest gallery – Muñeca Arthouse. The PAC Gallery is located at 20 Terry Street, Patchogue. Muñeca Arthouse is just a block away, located at 2 South Ocean Avenue. Slide Slam will feature selected artists presenting their work for five minutes each. Artists will have the opportunity to network with special guests including curators and arts professionals seeking new artists. This program is part of PAC’s 2018 imPACtful connections: Island-wide networking for creatives and supported in-part with public funding provided by Suffolk County. This special programming will consist of five Slide Slam events serving as a catalyst to help unify LI’s creative clusters by creating numerous substantial opportunities for artists through collaboration with other organizations, curators, collectors, arts professionals, and collectives. As a result, we will strengthen the collective artist presence on Long Island like our neighboring arts communities such as Brooklyn/Dumbo, Hudson & the like. Slide Slam hosts will include Patchogue Arts Council (x2) & Muñeca Arthouse, Paul W. Zuccaire Gallery, Heckscher Museum of Art, and Haven Art Gallery. Slide Slam events are free and open to the public. *This program is supported by Suffolk County public funding.